View our cheap engagement rings here. Many people equate engagement rings with money – lots of money. The inability to find affordable engagement rings often puts a damper on an otherwise joyous occasion. However, cheap engagement rings exist - both in a good sense and in a bad. Cheap engagement rings can be just as beautiful as more expensive rings if they are properly made. At Novori, our diamonds and engagement rings are competitively priced, quality made, and aren’t devoid of beauty or quality. Novori sells high quality engagement rings at reasonable and fair prices. We never make rings cheap in quality, just very affordable with the finest quality. Aren’t cheap engagement rings bad investments? Not necessarily. Some cheap engagement rings are worthless, and you do need to be careful when buying online, but many more are valuable. 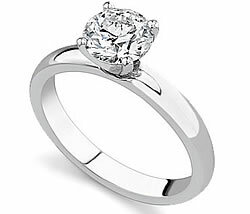 Novori makes all our engagement rings in the USA for the hightest quality, yet we keep our prices as low as possible. Purchasing cheap engagement rings online saves you money. Online jewelers often carry high quality cheap engagement rings. Just because you can’t pay thousands of dollars for your ring doesn’t mean you shouldn’t have a nice one to wear. We pride ourselves on offering outstanding, high quality jewelry at affordable (or cheap!) prices. Are cheap engagement rings hard to find? No, cheap engagement rings aren’t hard to find. As we said earlier, locating cheap engagement rings online is easier than visiting traditional jewelry stores. However, buying cheap engagement rings online can be risky because you can’t see the ring before purchase. Unlike some online jewelers, Novori offers a 30-day money back guarantee on all our jewelry. When shopping online, you should only buy jewelry from stores offering a money back guarantee. Don't buy cheap rings, buy inexpensive rings that have good quality in them. If it is necessary to return an item, it’s smart to get insurance coverage. Protecting yourself from lost or damaged mail is important. How do I start my search for cheap engagement rings? First, decide on a budget. Have a realistic budget for you engagement ring that you can afford. Once your budget is set, it’s time to decide on the metal. Choosing inexpensive metal is a great way to cut the cost of your ring. Platinum isn’t cheap, so if your budget is tight, consider white or yellow gold. You’ll receive a beautiful ring that’s about half the price of platinum, but just as beautiful. Consider low karat diamonds. They’re inexpensive, and if you’re on a budget, you’ll want to skip big karat diamonds. Keep in mind that cheap engagement rings rarely have intricate patterns or etchings. The more work involved in creating the ring, the more the cost. When it’s time to pick the diamond, you should pay attention to diamond quality. Many factors influence a diamond’s price. The cut, clarity, color, and karat all come into play. A less than perfect diamond will cost less, but that doesn’t mean it will look bad. Cheap engagement rings are often indiscernible from more expensive rings. We have diamonds of various grades which are all excellent quality. You can drop a grade or two, and still have a great diamond. Our diamond experts are ready to assist you with your diamond selection. You can call Novori toll free. Cheap engagement rings - What to watch out for. There are some things that should be avoided when looking for cheap engagement rings - never sacrifice on quality. Even with our fair and reasonable prices, Novori engagement rings are custom made in the USA and made with solid metals. When shopping for a cheap engagement ring, find out where the rings are made and ensure they are not low quality imported rings which are sometimes hollow and mass produced. Another warning sign is online web sites indicating deep discounts. Do you really think you can get 70% or 80% off of a price and get a quality ring? At Novori we keep our prices low on all our products every day. We never sacrifice on quality on any of our rings and always have fair and honest prices. Your engagement ring will be worn every day for a lifetime. Beware of sites that play the pricing games and only sell cheap rings where the cheap refers to the ring quality. Cheap engagement rings should never be cheap in quality and can be better named affordable engagement rings. At Novori we don’t sell or recommend synthetic or imitation diamonds, but they’re worth mentioning. These stones aren’t real diamonds, but they look like the real deal. Some people don’t mind fake diamonds, and consider the symbolic meaning of the ring more important than its authenticity. However, you should never try to fool your future bride or groom into thinking a fake diamond is real. Instead, browse our selection of cheap engagement rings and you will find something that will satisfy both your wallet and the recipient. With our help we are confident we can find a real natural certified diamond within your budget. Help is just a phone call away. If you need to use a synthetic diamond for your ring, don't hide the fact that it is not a real diamond. It is always better to be honest and up front and promise her to exchange it for a real diamond sometime in the future. At Novori Jewelry a cheap engagement ring or a cheap wedding ring is lower in cost but is still a ring of great value and is never any less in quality or workmanship. We sell cheap engagement rings or, affordable engagement rings, that you will love and cherish forever - guaranteed!